To recap, the theory is that heat shock proteins can hide genetic variation until a stressful environment exposes them to allow rapid change (evolution) of morphology and subsequently, traits. Hsp90 acts as a buffer against phenotypic variation, allowing genotypic variation to build. When the buffering capacity of Hsp90 is altered (e.g., in nature, by mutation or environmental stress), the genetic variation is “revealed,” manifesting itself as phenotypic variation. This phenomenon raises questions about the genetic variation before and after what I will call a “revelation event”: Is it neutral, nearly neutral, or non-neutral (i.e., strongly deleterious or strongly advantageous)? Moreover, what kinds of evolutionary processes do we take to be at work? My goal with the previous posts on Hsp90 was to show that the data lends sufficient support to alter and revise how we think about evolution. It seems this is the goal of the review as well. The primary goal of this paper is to illuminate the alternative scenarios and the processes operating in each. At the end, I raise the possibility of a synthesis between evo-devo and nearly neutral evolution. I find it somewhat ironic that people who are otherwise unorthodox in their thinking with respect to evolution are so orthodox when it comes to adaptationism. After all, as the late Gould argued, nonadaptive approaches were left out of the evolutionary synthesis (Gould 1983) just as developmental processes were (Gould 2002). Which to me, a molecular biologist gone amateur evolutionist, is a good ending note. Reviews like this, one can only hope, will lend credibility to alternative thoughts on mechanisms of Darwinian evolution. Which is surely needed to fully understand the beauty and complexity of the molecular mechanisms that shapes our world. Note: the review I have linked to is open access, but apparantly only a draft, the final version is available here, but isn’t open access (shame on you Biological Theory and MIT press Journals). Previous posts have shown Hsp90 to be a molecular buffer allowing rapid morphological changes in times of stress. As will be discussed below, such a buffering function supports the evolutionary theories of punctuated equilibria, hopeful monsters and canalization. 1. Even if Hsp90 can promote rapid changes in phenotype (appearance) how is this change retained (fixed) for future generations ? This fixation has been demonstrated to occur (see Sangster TA et al. ), and the traits become independent of Hsp90. The exact mechanism(s) however remains to be elucidated. Models for genetic fixation follows the theory of canalization with Hsp90 functioning as the Waddington’s widget (see Semin Cell Dev Biol. 2003 Oct;14(5):301-10). This is discussed further under the next bulletpoint, the second question…..
2. Does these aspects of Hsp90-function fit into current models of evolution ? Yes, although some of these theories are controversial. First we have the idea of punctuated equilibrium and hopeful monsters discussed in my previous post. To expand on these ideas let’s also include the theory of canalization. Canalization explains punctuated equilibrium by referring to an organisms buffering capacity (to counter the potential deleterious effects of mutations). The theory was put forward by C. H. Waddington more than 50 years ago, but is still controversial it seems. Hsp90 is a molecular explanation of the canalization concept in that organisms with different genotypes express the same phenotype until times of stress. There are also indications that other heat shock proteins or other “signaling hub”-proteins or even miRNA can serve such buffering functions (see references within this review). Taken together, these controversial evolutionary theories and the experimental evidence on Hsp90 supports one another, and a paradigm shift in evolutionary biology is in place. 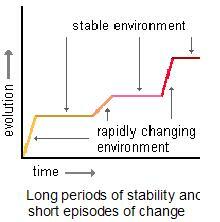 Darwins theories are correct up to the point of gradual and constant evolution of traits. Evolution instead, occurs in bursts. This series of blogposts have conveyed the molecular evidence for such punctuated equlibria and canalization, which comes from studies on the molecular chaperone Hsp90. I hope I have enlightened and convinced at least some evolution biologists into believing that Darwins theories can be expanded to include these (no longer controversial) theories.